I came accross this funny video clip today and it comes from the Late Show with David Letterman. In the clip, U.S. President George W. Bush gives a speech at a Florida rally. However, as most political speeches are orchestrated at rallies, a crowd of supporters is usually herded behind the speaker applauding and/or nodding at remarks made during the speech. The support crowd is all about the image of support and agreement with the speech, of course. However, in a lapse in image awareness on behalf of the American president’s staff, a 14 year old boy stood behind the president during the entire speech and yawned, fidgeted, checked his watch and even appeared to have fallen asleep at one point. We’ve been hearing little bits and pieces of information surrounding Denmark’s audacious aggression in claiming sovereignty on Canadian soil. After all, at first it sounds like a joke: Petite, aggressive European Nation dares fly its flag over Hans Island. Alas, it appears to be true (yes, this story has me questioning the veracity of the Canadian print media — more than usual that is). Has our proud nation really slipped this far whereas a small country such as Denmark (of all places) asks itself, “Why not? What’s Canada going to do about it?” Sure, this territorial dispute may be seen as some as two squabbling kids in the backseat of the world with Denmark saying, “Look at what I’m doing, I’m on your side.” However, as limited as this dispute actually is, Denmark has blatantly, and with impunity, infringed upon our sovereignty. Would they even think of doing this on American territory? Why is American sovereignty seen as impregnable while the redefinition of Canadian sovereignty need not require a second thought? And where is our ambassador to Denmark throughout all of this mess? While the Liberals thought that it might be a good idea to tuck him away in some European country, he’s now back and at the centre of the Sponsorship Scandal. 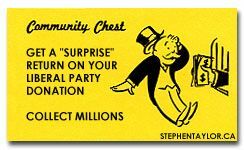 Ironic is that the money that the Liberals siphoned away could have been used on our military to deter challenges to our sovereignty. Meanwhile, we do not, at present, have an ambassador to Denmark. Therefore, I do submit my services to the Prime Minister and to the people of Canada to immediately serve as Canada’s ambassador to Denmark. An abridged resume is posted below. Now, the above two items should better qualify me for this post than Mr. Gagliano. Sadly however, these qualifications may actually disqualify me. Posted on March 30, 2004 Author Stephen TaylorCategories OtherLeave a comment on Excuse me?! To remove myself from federal politics for a minute, I thought that I should mention that I met a one Mr. John Tory today in Kingston. The former Toronto mayoral candidate was visiting Kingston today on a listening tour to set his ‘potential’ plans in motion for a run at the Ontario PC leadership. At a small meeting of about 20 people at Aunt Lucy’s restaurant, Mr. Tory addressed our group and fielded our questions and concerns for regaining provincial conservative grassroots support and for citing lessons learned during the last provincial loss to the Ontario Liberals. 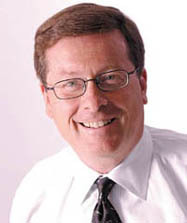 John Tory asserted that campaigns cannot be based upon personal attacks and that such attacks reflect upon the lack of confidence in one’s own policies. Tory reminded us that the mayoral campaign was free from such attacks by all candidates. The campaign debt incurred by the provincial PC was cited as one of the principle hurdles facing the party in the future. In his professional career, Tory raised hundreds of millions of dollars for various organizations such as the United Way and St. Michael’s Hospital. He also mentioned that his mayoral campaign was debt free and that he helped/is helping two other mayoral contenders clear their debts. I spoke with John and asked him what his “issue” was going to be should he become leader. Tory noted that if McGuinty’s liberals keep breaking their promises, it’ll be government accountability. However, he noted that the leadership race is far enough into the future and that a provincial election is even further and that Ontario may face a myriad of issues by then. After learning about my federal Conservative nomination bid for Kingston and the Islands, John told me that I should run provincially for the PC. What does one say to that? I think that I blurted out “Give me a call, let me know” Then we exchanged business cards. And that was my encounter with a one Mr. John Tory. Seems like a nice guy. Here’s a fresh report from the National Broadcaster detailing death threats received by the former vice-president of Groupaction, one of the advertising companies at the centre of the Sponsorship Scandal. This story is still developing but it appears as though Adscam has almost reached Nixonian proportions. Apparently, this is not the first time Mr. Richard has received threats to his personal safety. In February, CTV news reported that Richard has received numerous threats including one in the middle of the night which stated “Don’t show yourself at the office the next morning”. He has also described receiving anonymous phone calls and letters. Richard told CTV news that he doesn’t trust the RCMP or the government for protection and has resorted to hiring his own bodyguards. In a poll released this week by the fair pollsters at Ipsos-Reid, the Liberals appear to be stuck in minority territory since the last poll released. However, the other parties moved slightly (albeit within the margin of error). The Conservatives are up 1% to 27%, NDP down 2% to 15%, Bloc Quebecois down 2% to 10% and the Green Party up 1% to 5%. The recent events of the past week have been the Conservative Leadership Convention and the Liberal Budget. The Budget should have provided a boost in support to the Liberals but it provided little for either social spending on one hand or tax cuts/job creation on the other. The election of a new Conservative leader should have also provided a boost in the polls for the Conservative party as stability should be perceived in the new party. However, Mr. Harper was the leader of the official conservative opposition before the merger and now he’s the leader again. The Conservative team will accentuating Mr. Harper’s image as a moderate and as a logical and safe choice for the replacement of the Chrétien/Martin Liberals. Most interesting, however, is a report today by the National Post which states that in another poll, 53% of Canadians would be undecided voters (or could change their minds) in the next federal election. I don’t remember seeing the undecided numbers so high in recent history. It appears that Canadian confidence in the Liberals has finally been shaken and now Canadians will have to consider other options. In the end, it may come down to a two horse race between the Liberals and the Conservatives as many Liberals see a valid 2nd choice in the Conservative Party. Indeed, a conservative party has always been the choice of Canadians when they’ve been ready to remove the governing Liberals from office. Further, during election campaigns the Liberals have always lost popular support while the Conservatives have gained it; every election campaign in recent history has been the Liberal’s to lose. These numbers should be very troubling to Mr. Martin and I’d be surprised and astounded if he thinks that he can bank on apathy this time around as his predecessor, Mr. Chrétien did in 2000. Canadian democracy appears as if it is starting to come back to life. A competitive democracy is in everyone’s interest after all, for only then is a mandate received a mandate earned. The Toronto Star has a report this morning about the Liberal strategy for the upcoming election. As I’ve said before, the Liberal strategy is going to be to play Paul Martin. According to the Liberals, the upcoming election is going to be about one thing: the Rt. Hon. Paul Martin. The Liberal Party of Canada will be aiming to capitalize on his apparent title: Right Honourable. The Conservative Party has been attempting to find evidence that Mr. Martin has indeed dipped his hand into the so-called honeypot. For the most part, the Tories have had different levels of success. No smoking gun yet, as they say. So the Liberals are going to run their front man out-front where he stands 20 points ahead of his embattled party. Starting next week, the PM is to appear in a television ad campaign, to prepare the “down but not out” and “damaged but not busted” “Liberal machine” for the next election which is expected in May or June. 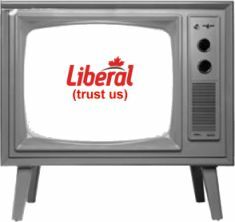 The timing of these advertisements indicate that the Liberals are set to charge right through their scandal before its settled in the minds of the Canadian electorate. The past two weeks of testimony have merely raised more questions than have been answered. Ralph Goodale’s budget even raised revelations of a previously secret $100 million Liberal slush-fund (or honeypot, as Conservative MPs are calling it). A spring election? How could they!? Therefore, the Liberal plan is to seek power instead of principle as they ask the Canadian public, not yet informed, for another mandate. It was a hard fought race with three of us lending our name to our members to choose the next Conservative member from Kingston and the Islands. Blair MacLean, Ron Turley and I spoke to the Conservative membership on Monday night and answered questions as a panel of nomination contestants. In the end Mr. MacLean was elected as our candidate and I am encouraged that our party has choosen this very capable politician for the upcoming battle against the Liberals and their atrocious record of government irresponsibility. I do wish Mr. MacLean the best of luck and with our effort, the grassroots effort, we will have the next Honourable Member from Kingston and the Islands in Mr. Blair MacLean. I’d like to thank all of you who came out in support and, indeed, I’d like to thank all members and all of the volunteers who made their way out to the Olympic Harbour on Monday to show that, as Conservatives, we are back; our party is the government in waiting. Paul Martin will drop the writ any day now (incredibly premature in my opinion). For those of you who’d like to help our party defeat the Liberals in the next federal election please email Diane Duttle or myself. With our hard work, we will have Blair MacLean in Ottawa representing Kingston and the Islands. I’d like to congratulate Mr. Blair MacLean for his victory on nomination night. I was very encouraged by the turnout to both the leadership vote and the nomination vote. As Conservatives, we’re back. We had some Liberal malcontents (now proud Conservatives) at the nomination as well! I’ll be posting more thoughts on tonight when I’m not so exhausted. This was my speech on nomination night. Some of you who couldn’t attend have asked for a transcript of it. So here it is. First of all, I’d like to thank Lou Grimshaw, our riding president for his kind words and I’d like to thank all of you for attending this evening. Our choice this evening is not one that is difficult; after all we will be choosing a conservative tonight. Indeed, as Conservatives we choose professionals over patronage, values over vitriol, and constituents over corruption. I stand before you tonight, proud to be a Conservative. My name is Stephen Taylor and I am seeking your vote tonight so that I may represent you on the next federal ballot. I have been a resident of Kingston for five years and my family has been shaped by this city over three generations. My grandfather came to Kingston as a student and then left as an officer who fought in the second world war for King and country. His commitment to Canada serves as a source of my inspiration as I too want to provide service to this country that I love. I have never experienced the tragedy of war and I am thankful for his service to Canada. It was in that war, that Canada strengthened its alliance and its friendship with our two historical allies, the United States and Great Britain. It was after this war that Canada took a great role in lending its wisdom to the international community and it is now, after 11 years of wasteful and inappropriate Liberal governance that Canada has all but lost its face and its guidance among our greatest allies and friends. Kingston has had a proud military tradition and I want to fight to restore this pride. As a biochemist from Queen’s University, I have had the opportunity to work and learn from a challenging field based on developing innovative ways to solve problems. My recent work has ranged from investigating the causes of drug resistance in the treatment of malaria to my work in developing gene therapies for the treatment of prostate cancer. In the wake of the sordid corruption of the governing Liberals I have had the opportunity of speaking with John Williams, the Conservative Member of Parliament for St. Albert and the chair of the House of Commons Committee on public accounts. The same day that he grilled Alphonso Gagliano for his role in the Liberal Sponsorship Scandal, John and I had a conversation surrounding our mutual concern for government accountability and honesty. Upon informing him of my intentions to seek this nomination and to stand before you all tonight, the honorable Mr. Williams did say that “I could tell the good people of Kingston and the Islands that Kingston will finally have a Conservative voice in Stephen Taylor.” John informed me that I could call him anytime to arrange for his visit to Kingston to help me campaign on a platform of government responsibility. After all as I’m sure you’ll agree, as Conservatives we are responsible people. John Williams is not the only prominent conservative to lend his endorsement. Jason Kenney, Conservative Member of Parliament for Calgary South-East has kindly endorsed my campaign to be your representative. Jim Flaherty, member of Ontario Parliament and former Ontario PC leadership candidate, has also given me his kind words. I also find the guidance of Rahim Jaffer, Member of Parliament for Edmonton-Strathcona, particularly heartening as he too ran as a young candidate and then became one of this country’s youngest MPs in history at age 25. I am a younger candidate, yet I believe that this is an asset. My bid for nomination started six months ago after the formation of our new party and after a discussion with Peter MacKay. As a young candidate my nomination would bring national media attention upon Conservatives in Kingston and the Islands and upon our party as the NEW team, the NEW Conservatives and the NEW government. As I’ve said many Conservatives have already joined my team. I ask today that you join my team; I ask that you join OUR team. We’re already calling it the “Blue Wave Campaign” and we will give Kingston the Conservatism it desires, we will give Ontario the Conservatism it wants and the Blue Wave will wash over all of Canada, sweeping out all of the sordid Grit with it. My name is Stephen Taylor, let’s get our campaign started right now! I will be seeking your vote tonight at our nomination meeting for Kingston and the Islands. 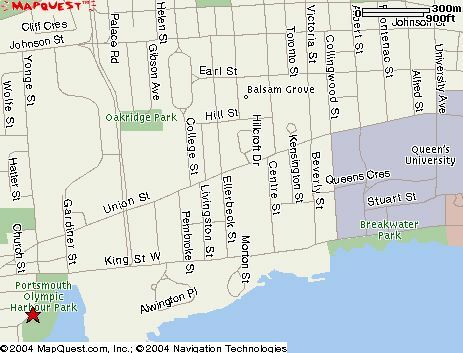 The meeting is at the Portsmouth Olympic Harbour and registration is from 6:30-7:30pm. Let’s start our campaign to dethrone Peter Milliken tonight! Groupe Everest is one of the Liberal-friendly advertising companies that is at the centre of the Sponsorship Scandal. The firm donated $71,321 to the Liberal Party of Canada between 1997 and 2001. Groupe Everest was founded by Charles Boulay who also happened to have worked on Paul Martin’s 1990 leadership bid. Boulay’s name has also not been foreign to the House of Commons where members of our Conservative party criticized then-Public Works Minister Don Boudria for having a family stay-over at Boulay’s lavish cottage. The minister was later demoted. It is rather unfortunate that the mess that these people have made will have to be cleaned up by the next government that is formed. The House of Commons has become a theatre for criminal investigation rather than a legislative body. Let’s sweep out the gritty dirt, establish and enforce proper practices for government contracts and then start legislating as intended. In other news, Alfonso Gagliano is set to testify to the committee on March 18th. It will be interesting to watch.